Its with a heavy heart that I write this message. I know how important the forum was to my father and I'd say that many of you were some of his closest friends despite whatever the distance may have been. Doug (Nuhawk) Reynolds passed away on Friday evening. I arrived in Austin on Saturday to find the Superhawk on the trickle charger so I imagine he was going to go for a ride this weekend. 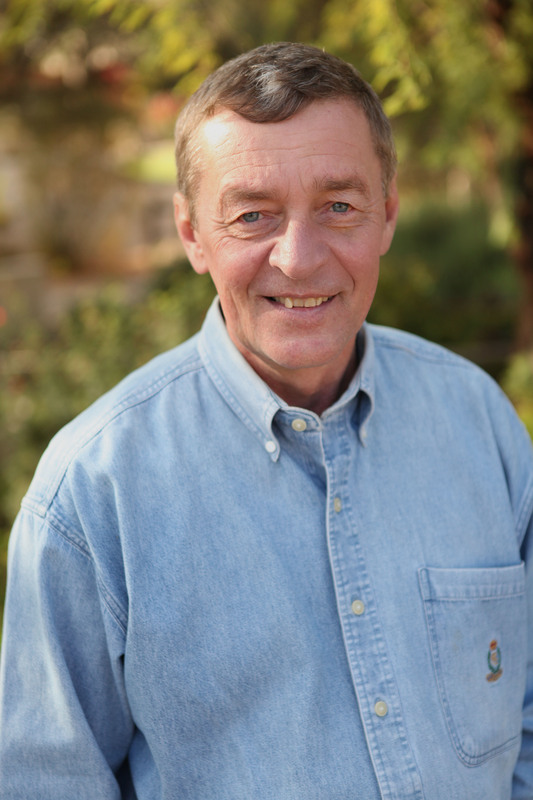 I will be hosting a memorial service on Friday evening for him in Cedar Park, TX. I'm sure for some of you attendance isn't going to be an option. I have yet to firm up the details but I should know more about location and times by midweek. I'm trying to dig up photos of the bike build and photos from when we went for rides. I will be sharing those on the forum as I find them. If you'd like to contact me directly about the service please feel free to do so. Very sorry to hear this..... 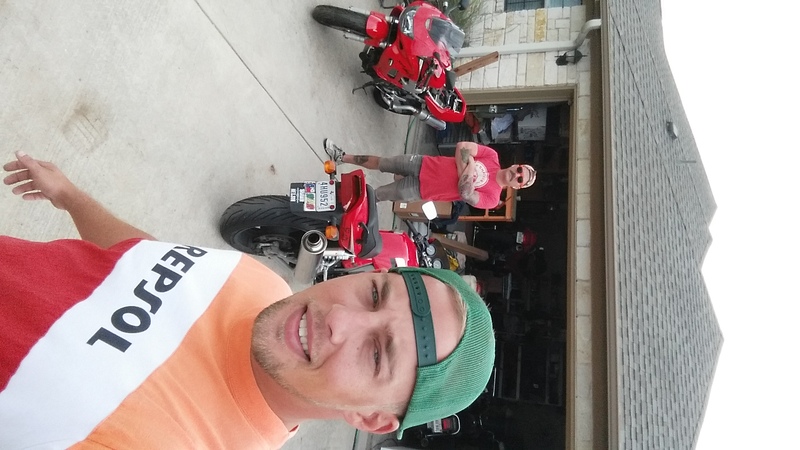 I enjoyed oth riding with Doug and puttering about at his house/shop/buisness. Very sorry to hear that Charles. My deepest condolences. He'll certainly be missed here and obviously by all his friends and family. I'm sure we'd all love to see some pics if you'll be kind enough to post them up as you have time. Last edited by Wolverine; 11-07-2016 at 02:52 PM. May I offer my condolences and heartfelt sympathy. Your father was apparently a great man. Fly high Doug. I'm really sorry to hear about this, it must be very difficult. I've yet to lose a parent and that is not something I look forward to. My prayers are that your family has peace and comfort during this time. So sorry to read this... please accept my heartfelt condolences. Though I had never had the good fortune to ride with him, I got to know him via this site and he helped me out on a couple of occasions with some shipping issues. Your dad was a true gent and will be sadly missed. RIP my friend. I really appreciate all the kind words and I know my family will as well. We will be having a viewing in cedar park, tx at the bech funeral home this Thursday from 5-8. We welcome anyone to come that would like to. Same for his burial which will be held 3 pm this Saturday at our lady of the rosary gardens in Georgetown Tx. I might need some help and this may take some time but I cant emphasize how important this site and the Superhawk were to him. It truly was his prized possession. I would like to have a memorial ride at some point in the future. Going into winter I know this is not prime. Maybe we can plan something in the spring when the weather is fair. He would like that. So sorry to hear about your loss and everyone elses... my deep condolences to you and the family, It is very sad, I sure would hope that maybe you could keep his legacy on this forum, he was a great man. I am terribly sorry to hear this. I just spent yesterday "celebrating" the 1 year anniversary of my dad's passing so I have an idea of what you are going through. Condolences to you, your loved ones, family and friends. You and your family will be in my prayers today. Please keep us posted on the memorial ride. I would like to ride in the line if my bike is up and running at that point. Last edited by Meier Link; 11-08-2016 at 04:33 AM. This photo was taken at his mother's 93rd birthday. Doug lost his father when he was 10 years old. I find a lot of comfort knowing his passing was on his father's birthday. I've been hunting for pics of Doug , his bike, us having a burger at andice, riding ect.. Feel sure I have some but they elude me right now.. If I find some I'll post up. I took a couple of his pc's in today to a computer guru and he is transferring hard drives. I hope to find some photos like that. "and now you're gonna be with me for the last ride"
I slept in today for the first time all week. I don't know if I was feeling sorry for my self or exhausted from the whole week. It's finally setting in that Dad is gone. Around 12:30 PM something yanked me from my sleep and it was THE HAWK! I poured a cup of coffee and headed to the garage. The neighbor told me he hasn't seen the bike leave in two years. Even though it has been on the charger the battery didn't hold up. I went to advanced and got a new battery. While I was there I googled how much oil it needed for an oil change since its been a while since I've changed it. (duh first link was to the forum) Dad was the second entry and in his entry was a free download for a manual for working on the bike. I laughed, he is still here coaching me after he's been gone for a week. This brought a smile to my face. 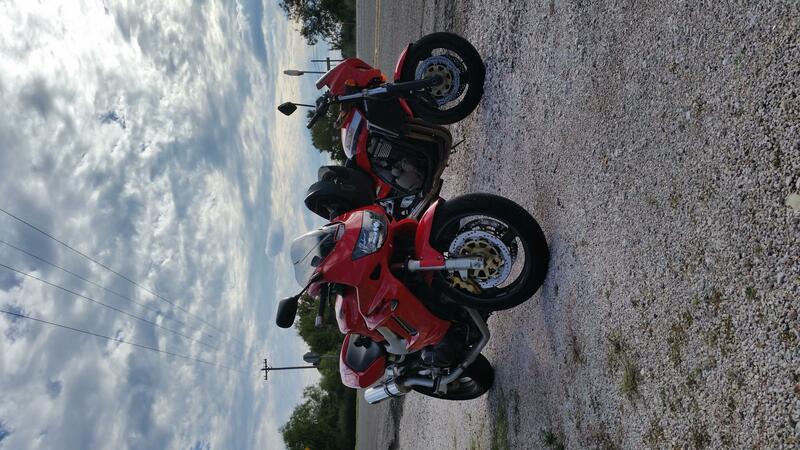 A childhood friend and I tore out of town on the bikes. Bailey rides a Ninja 1200. Not a Honda but at least its red haha. 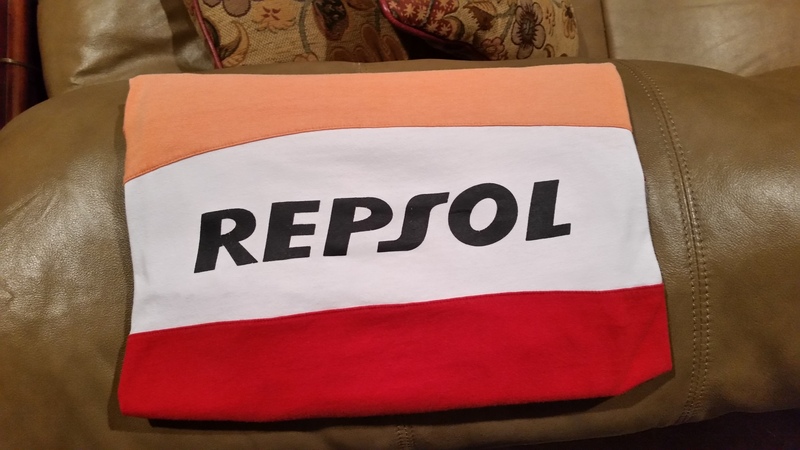 I wore Dad's Repsol shirt that he got when I was 17. I tried to ****** it one night for "bike night" in Austin. I was caught and he said, "don't take that." I replied, "but dad its cool.." I was then answered, "I know, put it back." To say the least Dad had HIS stuff. Among these things were the HOLY GRAILS. The Superhawk, his truck, and that shirt. I never was able to sneak it past him. I wore it today as though it was mine. But, thinking back, I will leave it in his casket tomorrow when we lay him to rest. This will be the last post from this account. I wanted to share again with his closest of friends. I think this place provided an escape. I will be joining the forum as a proud new Superhawk owner. Should be a few Superhawk shirts around. He had some input on one design, which is how I got to know him. I've used input from a few different members here over the years. I'd love to see his bike entered in VTR of the month, weather as his or yours. It's real cool hearing you find his influence here. I think this bike has already won for this month. Everyone else can automatically be entered for December in my opinion. Wes, no one is even entered for Nov. I don't recall this bike winning recently either, am I wrong? I think I speak on behalf of many here when I say thanks for the manner in which you have shared this ordeal with us. Your dad was a class act, and it's quite obvious that trait has passed on to his son. I don't believe it has in a while. Should be a shoe in for the winner of the month. I will self nominate his bike to participate if someone wants to post the pic. Should be an honorary place holder for this month in my opinion. And with that I welcome you to the forum and will let this thread now fade away, though who it is about will always be here. Owning a high dollar Duke, does not mean you can ride a High $ Duke..